We’re over halfway through the hiatus, and to keep us busy speculating, Fox has released this Gotham preview. Although the preview is marked as being for episode 19, “Beasts of Prey“, it’s most likely that the clips shown are from all four remaining episodes (the preview clearly showed Carol Kane, and Carol Kane is not listed as a guest star for “Beasts of Prey”). Let’s take a look at some of the interesting things the preview shows us. Besides the fact we already know he’ll be teaming up with Cat to track down Reggie, it looks like Bruce will also be tracking down something a little closer to home. Namely, a secret his father kept hidden from him. We get a look at what appears to be Fish attempting to escape the island of The Dollmaker. We know this will be Fish’s last season. Does that mean she’s killed during her personal battle with Dr. Dulmacher? Will she get off the island, only to be killed, jailed, or locked away in Arkham once returning to Gotham? Or will she manage to escape, safely leaving Gotham behind her forever? On a shadowy street, we get a glimpse of Eddie killing a man on the street, followed by a rather chilling shot of him laughing maniacally. What brings about this killing? Is he so jealous of Kristen Kringle's boyfriend that he murders him in cold blood? Or is he trying to protect Kristen from some danger? And what is his next step, now that he’s committed murder? Barbara’s about to enter the most dangerous situation she’s ever been in, as she falls in love with a man secretly known as the Ogre, who lures young women with his charm only to kill them when they don’t live up to his standard. The Ogre’s storyline will stretch over three of the four remaining episodes. And, as unpopular a character as Barbara is, I do have to wonder if she’ll make it out of this alive. Viewers have always assumed she would eventually marry Jim and give birth to the child who would become Batgirl. But some now wonder if they’ll bring in Batgirl some other way (perhaps a niece or cousin of Jim), and simply dispose of Barbara this season. We’ll have to wait and see! We see quite an unexpected scene of Jim pointing a gun at Butch while angrily holding Oswald by the collar. I wonder what led Jim to acting so desperate? Perhaps it has something to do with that favor he owes Oswald? Speaking of Oswald, Robin Lord Taylor has said in interviews that Oswald will soon make a great power play which turns him into a target. And from the preview, it looks like this leads to him paying a terrible price. We see his mother, Gertrud, either wounded or dying (probably dying) in Oswald’s arms, as Oswald swears revenge on the person responsible. The question is, who is responsible? There are so many possibilities. Fish or Maroni killing her out of revenge, Falcone killing her as a punishment for Oswald revealing one of his secrets during the last episode, or even Butch killing her out of some loyalty to Fish he’s hiding. But while all these things are possible, what if the person who kills her is someone completely unexpected? Someone like Jim Gordon? I have no idea if Jim is really her killer or not, but I do believe it’s more likely than many people suspect. I don’t think Jim would kill Gertrud on purpose. If it happens, it will most likely be an accident (though it may end up unfortunately looking like he did it on purpose from Oswald’s perspective). In the scene where Jim is at Oswald's club, pointing the gun at Butch, he‘s getting very angry and reckless. I'm wondering if perhaps the situation gets out of control and he shoots Gertrud by accident. I don’t know if that’s the scene where Gertrud dies or not, but it could be. It certainly makes a nice opening for an effective death scene. And whether it’s that scene or a different one (perhaps even one in a different episode), you have to admit Jim is getting more and more reckless as time goes on. The writers are purposely showing how reckless he’s becoming. It’s leading up to something. And accidentally killing someone could be that “something”. This might be a bit subjective, but the way Oswald says "You will pay for this" to the person who hurt his mother, for some reason feels like he's talking to someone he wasn’t angry with beforehand. Like this is a new enmity. A scene like this works especially well if the person he now hates was someone he was fond of before. Someone like Jim. And if the killing was accidental, I can very well picture Jim trying to apologize, trying to say he did not mean to do this terrible thing; and Oswald, blinded by his anger, won’t believe him and swears to get revenge. In many ways, it makes more sense for Gertrud’s death to be accidental than it does for it to be a purposeful murder by Oswald’s enemies. Why? Because my mind keeps going back to that scene back in episode 12 when Oswald (while lying to Maroni) said “May God strike my mother dead if I’m lying”. I feel like the writers were being a bit prophetic when they wrote that — that they were setting up a sort of self-induced punishment for Oswald, where he swears something untrue before God, and God (or Karma or whatever you like) keeps him to his word. If one of his enemies purposely kills his mother, it would fulfill that… kind of. But then, since his enemies have been out to get revenge on him for a long time, it would be one of those things that could have happened whether he had made that oath or not. Whereas, if it happens by chance, it appears more as an act of God. Something that might never have happened if he hadn’t sworn something untrue. The showrunners have indicated that each season focuses on the origin story of one villain in particular, and this season is Penguin’s. This is the season that shows how Oswald Cobblepot becomes the Penguin. At this point in the show, he’s already calling himself “The Penguin”, he’s already evil, already owns a club. So, in many ways, he is “almost there”. However, I don’t think he’s all the way there yet. I’m sure the showrunners will want to do something surprising and dramatic with his characterization sometime within the few remaining episodes. And besides that, there’s still a little too much goodness and hope in him. He still needs to fall into darkness and villainy a little more. And something has to happen — something big and bad — for him to get there. Now consider this: Jim is one of the few people who brings out the good in Oswald. He represents what few ties Oswald has left to law, order, and hope for Gotham city. In order for the Penguin’s origin story to be completed this season, these final ties must be severed so he can finally reach his lowest point, solidifying him as the villain known as “The Penguin” forever. And there’s no better way of doing that than for him to either lose Jim, or for Jim to “betray” Oswald in some way. Jim accidentally killing his mother would be the perfect way to bring Penguin’s arc exactly where it needs to be as this season comes to a close. This is all speculation, of course. It may very well turn out that Gertrud is killed by one of Oswald’s enemies, or even someone we haven’t suspected yet. Again, we’ll have to wait and see. No matter the case, I am glad that it appears Gertrud’s death scene will appear on-screen — and her dying in her son’s arms, what's more. I hate to see her character go; but if she must, that is the ideal way. I can’t wait to see how things turn out, and what direction Oswald’s characterization will take once he loses the most important person in his life. Gotham starts again on Monday, April 13th, on Fox. 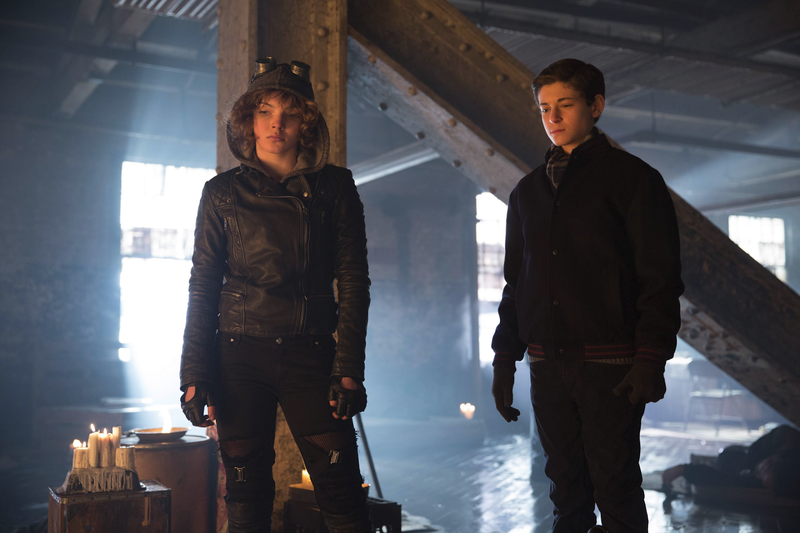 Gotham Recaps will begin again on Sunday, April 19th. But don’t worry, you won’t have to wait until then to get more Gotham fun here at The Fangirl Initiative. Join us next week as we explore the character development of one of the show’s most popular characters. See you then!